Click on a landmark icon to reveal its history or continue scrolling for an expanded landmarks list. In 1993, Lake Park was entered on the National Register of Historic Places site for two primary reasons: as a “designed historic landscape” by the master landscape architect, Frederick Law Olmsted, and as the site of the Lake Park Mound, a prehistoric Indian mound of assumed ceremonial significance. National Register designation offers protection from encroachments to contributing components and encourages park stewards to protect the planned park design, its natural features (meadows, ravines, bluffs, woods) and its built features (buildings, bridges, roadways, paths and trails). 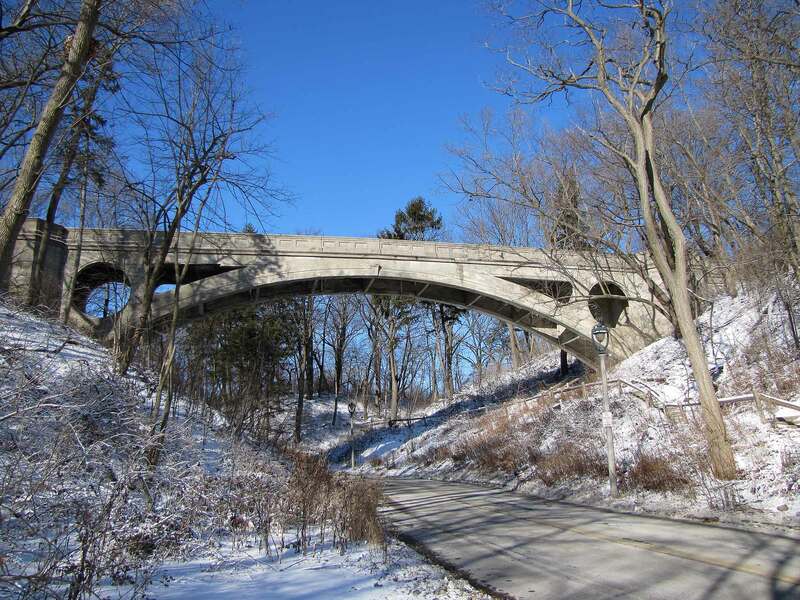 The brick arch bridge spans the large north ravine allowing traffic to enter the park from the north end. Designed in a Renaissance Revival style by Oscar Sanne, an engineer trained in Germany, the bridge was built by Gerhard F. Stuewe Co., masonry contractors, and opened in 1893. Sanne designed four of the five large bridges in Lake Park. Notice the terra cotta medallion designs and brickwork on the outer sides and the quatrefoil openings along the railing. This World War I memorial plaque was dedicated in memory of Mary E. Spence, national president of American War Mothers. She resided on nearby Newberry Blvd. A children’s playground has been in the park since 1906. Old photographs show wooden seesaws, a merry-go-round, toboggan slide, gravel wading pool, sandbox, and other equipment. The current equipment was installed in 1995 after neighbors conducted a successful fund drive. The ice rink warming house with restroom facilities was built in 1965. Lake Park Friends’ office is located here (2975 N. Lake Park Road). A handsome wooden children’s building designed by Howland Russell stood for many years in roughly the same location. Lawn tennis courts were installed in the park by 1909; location, size, and surfaces have changed over the years. This was the site of the former “Lake Park Depot”, a streetcar station designed by architect Howland Russell and completed in 1895. Lake Park was a popular destination; hundreds attended free concerts sponsored by the streetcar company, The Milwaukee Electric Railway and Light Company. Although we do not know who built this Indian mound, it is believed to have been peoples of the Middle Woodland Culture (300 BC – 400 AD). This conical burial mound is the last remaining of a group of mounds which were destroyed in the building of the park. It is also the last known remaining Indian mound in the City of Milwaukee. There are several rustic bridges, in the park. Most were built of logs and stones and are in the ravines. Christian Wahl, president of the first Milwaukee Board of Park Commissioners, designed and supervised construction of several rustic bridges in the 1890s. In 1936, workers for the Works Project Administration constructed 8 wooden footbridges and 25 check dams in the ravines. Several rustic bridges have washed away but many remain. This memorial plaque and nearby trees were dedicated to World War I heroes. The steel arch bridge with six steel arches and limestone abutments was designed by Oscar Sanne and completed in 1893. Although closed to vehicular traffic in 1964, the bridge is one of four bridges on “Lake Park Road,” a main road meandering through the park. The formal entrance at Newberry Boulevard, completed in 1896, has long been a floral showcase in summer with colorful beds in the median. Newberry Boulevard itself was designed by Olmsted as a link between Lake and River(side) Parks. A central feature of Olmsted designs is the “open meadow.” Designed in 1893, a 10-acre meadow was created here by filling in a huge existing ravine. The meadow was completed in 1898 and became site of a 6-hole golf course opened to the public in 1903. In 1930 the course was extended to 18 holes. Lawn bowling in Lake Park began in 1919 in an area near the current tennis courts. In 1961, the bowling greens were relocated west of the Lake Park pavilion, and in 1962, the clubhouse was built. A concert grove and bandstand (gazebo) built in 1903 previously stood at this site. The concrete footbridge spanning Ravine Road allows pedestrians to walk from the pavilion to picnic areas in the north sections of the park. Designed by Ferry & Clas, the bridge was completed in 1905. When viewed from Ravine Road, a modernistic cut-out design can be seen. The Lake Park Pavilion, designed by Alfred C. Clas, opened to the public on July 11, 1903. Designed as a picnic shelter, and used for decades as a refreshment site and gathering place, the main floor was converted to a French restaurant (Lake Park Bistro) in 1995. The lower level serves as a community room (Marcia Coles Community Room). A balustrade and concert gazebo located west of the pavilion were removed in 1954. The Lake Park Pavilion is located at 3133 E. Newberry Blvd.. The Grand Staircase, which descends from the east side of the pavilion to the bottom of the bluff, was designed by Alfred C. Clas and completed in 1908. A promenade led south from the staircase to concrete stadium seating for the athletic field; the promenade and concrete seating have been removed. The small concrete block building now used for park storage originally was built as a Nike missile tracking station in 1958, at the height of the Cold War. The station was dismantled in 1970. The equestrian statue honors Civil War physician Brigadier General Erastus B. Wolcott. The statue of Wolcott, Surgeon General of Wisconsin in the Civil War, was commissioned and paid for by his wife, Dr. Laura Ross Wolcott, one of the earliest women physicians in the country. The two Lion Bridges span the two lighthouse ravines. The bridges designed by Oscar Sanne were constructed in 1896-97. The oft-photographed lions, sculpted out of sandstone by Paul Kupper, were donated by Henry Clay Payne, then manager of the Milwaukee Electric Railway and Light Company. In 1964, the bridges were narrowed and closed to vehicles. On a narrow stretch of land between two deep ravines stand the North Point Lighthouse and Keeper’s Quarters. The original (1855) structures were endangered and abandoned when the bluff collapsed; new structures were established 100 feet to their west in 1888. In order to beam over growing park trees, the lighthouse was heightened in 1912. In 1984, the North Point Light Station was entered on the National Register of Historic Places. In 2007, with funding from North Point Lighthouse Friends, the keeper’s quarters were restored and opened to the public. A children’s playground has been in the park since 1906. Old photographs show wooden seesaws, a merry-go-round, toboggan slide, gravel wading pool, sandbox, and other equipment. Another wood structure playground was installed in 1995 after neighbors conducted a successful fund drive. The current playground was installed by Milwaukee County Parks using grant money in 2012. The two Lion Bridges span the two lighthouse ravines. The bridges, designed by Oscar Sanne, were constructed in 1896-97. The oft-photographed lions, sculpted out of sandstone by Paul Kupper, and cast and carved by stonecutter, Otto Lachmund under Kupper’s direction were donated by Henry Clay Payne, then manager of the Milwaukee Electric Railway and Light Company. In 1964, the bridges were narrowed and closed to vehicles.